With the addition of the International 4400 truck, New River CTC can now provide better workforce training for students. GHENT, W.Va. -- Students at New River Community and Technical College’s Advanced Technology Center in Ghent now have another resource for gaining hands-on experience. 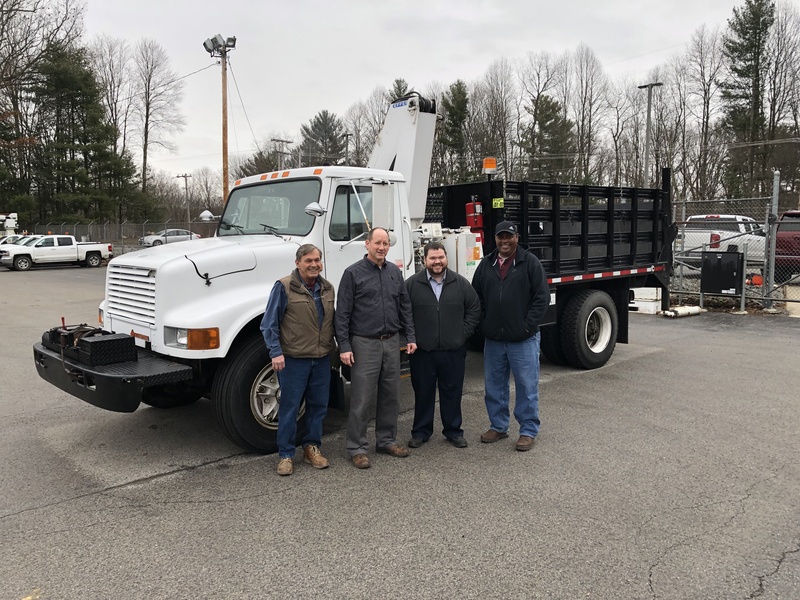 Appalachian Power Company recently donated an International 4400 Freightliner truck to New River CTC for student use in the college’s workforce training and technical programs. "The donation will specifically provide the electric distribution engineering technology [line service] students more hands-on experience with the truck as well as expand the college’s pintle hook offerings," explained Program Specialist Brian Sampson. "We are very excited to have updated equipment available for our students,” said Dean of Workforce, Technical and Community Education Dr. Jerry Wallace. “Appalachian Power Company has been a wonderful partner and we are thankful to have their support." The Certificate of Applied Science in Electric Distribution Engineering Technology (line service) provides students with the technical skills needed for careers in the electric, cable and telephone, construction, subcontracting, railroad and oil and gas industries. The college also offers pintle hook training through Workforce Education. For more information on workforce and technical programs at New River CTC, visit www.newriver.edu/workforce or www.newriver.edu/technical or contact Sampson at 304.929.5009 or bsampson@newriver.edu.